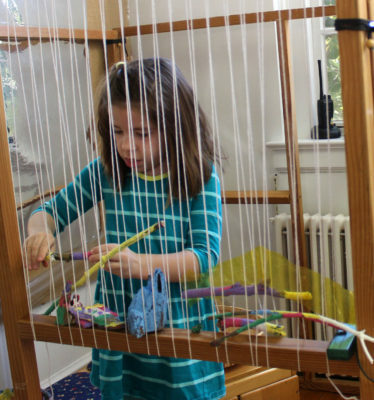 What does it mean for a young child to find her voice? We are witness, in so many ways, to the miraculous process in which children realize that they have their own agendas, and that, though they have to work within the parameters adults set to keep them safe physically and emotionally, they can make any idea visible, any plan real. Once they develop the discipline required for dialogue, they learn to articulate their theories and challenge each other’s thinking, and they learn to expect people to listen to and honor (or challenge) their ideas. They also learn to pick up on ideas around them and develop the disposition to join an interesting project or innovate on someone else’s kernel of an idea. When a community is as full of active voices as this one, a tiny bit of an idea from one child can grow into a collaborative venture. This is a small story from an ordinary day in February. By that time of year they had had many opportunities to develop the above dispositions and disciplines. 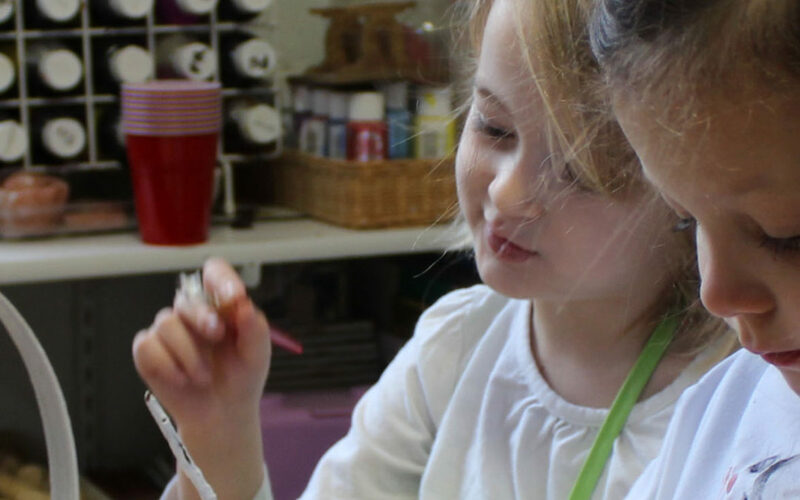 The result: a project initiated, organized and realized by a small group of children, from the minds of two children to the entire class; a project made possible by the children’s sense of agency and disposition to exercise their voices. On the morning that this story began, as we had our entrance meeting, Alice showed a bag of “baby pinecones” that she collected over the weekend. I don’t know if Alice’s pinecones inspired Hailey or if, as she often did, Hailey came to school with the idea. 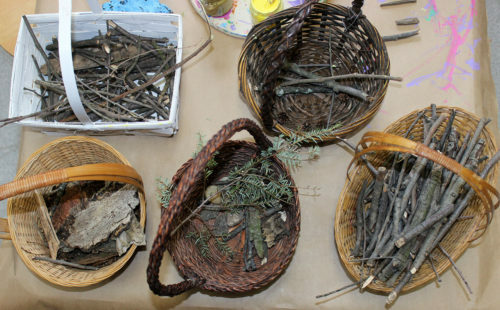 But Hailey declared that it was her plan to collect natural materials in order to paint them. The juxtaposition of Alice’s collection and Hailey’s idea started a movement. 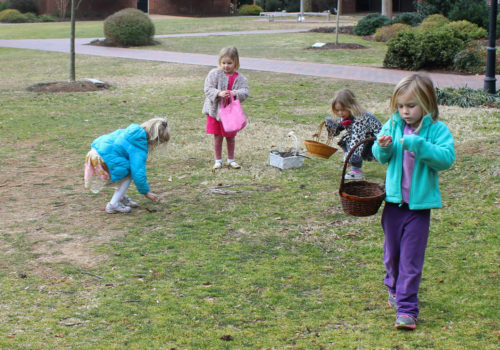 Six children self-selected to go hunting on campus for natural materials that they could paint. Almost as soon as they found their first natural materials, the collectors decided to sort them. 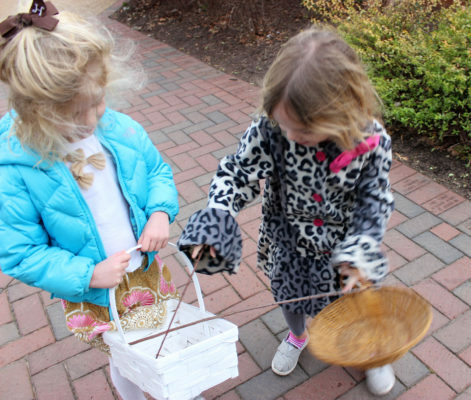 The children came to an agreement: this white basket is for sticks. Here a friend tries to fit two long sticks into the white basket. 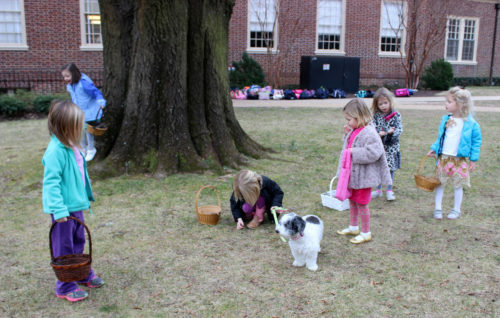 During the hunt, the children encountered an Upper School teacher. She asked what they were doing, and the children explained what they were collecting and why. Eventually, the children had to give up the idea of sorting the natural materials as they found them; there were just too many of some kinds of materials! Sorting became important to the children again when they were looking for specific pieces to paint. 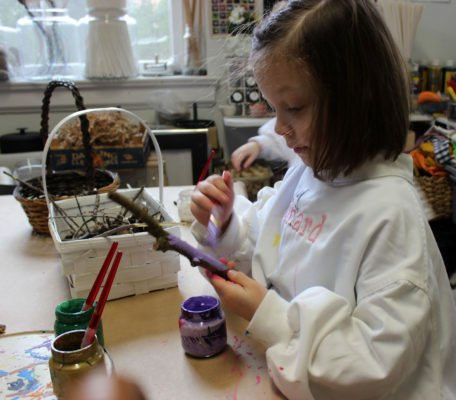 Once back in the classroom, the children chose paint colors they wanted to use. 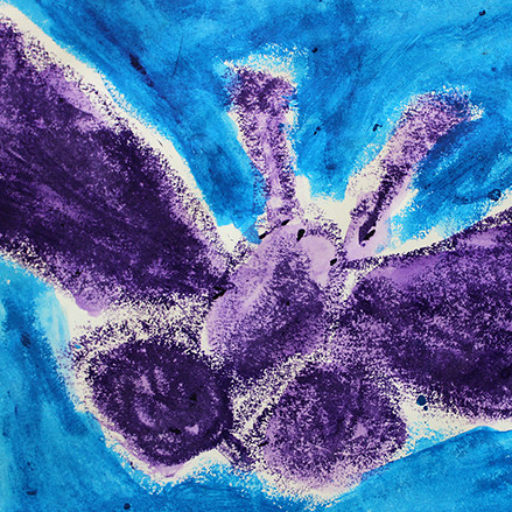 A few of the children made other plans, but four stayed and painted their collection. “We want to show everyone our collection!” they declared. We made space for them to present their work in Meeting, after which the project members invited anyone who wanted to paint to join them. Even those not in the original group returned from their journey across campus to the gym later that day with hands full of sticks to add to the collection. We teachers had no idea what, if anything, this initiative would become. But it didn’t matter. Whether it “became” something bigger or not, we recognized that the children had exercised their voices and discovered the power therein. 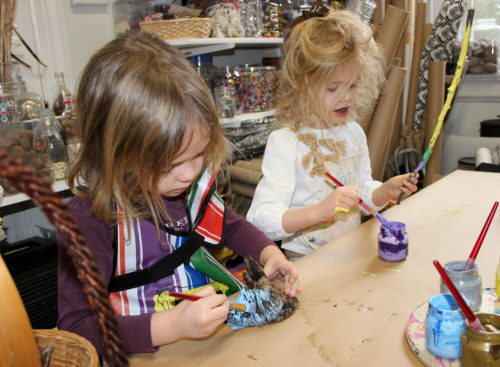 Hailey and Alice experienced the remarkable power an articulated idea can hold; the collectors organized themselves to sort the materials; the children explained their mission to a stranger; and they recalled the experience aloud at Meeting and decided to invite others into the painting phase of the project. 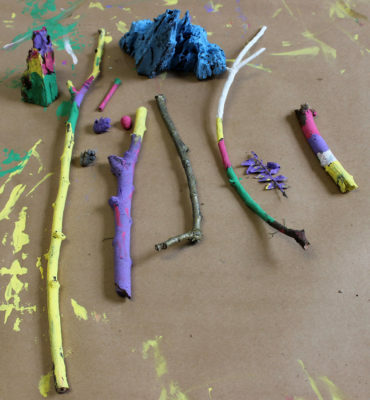 The beautiful first results of the “painting natural materials” project…initiated, organized and realized by the children themselves. In the end, the children offered some of the painted materials to weavers.